In exploring the grotesque I am encountering new epiphanies in photographs found online or in obsolete books. The selective eye screens thousands, hundreds of thousands of images before, like a fly it settles on something choice to feed upon and thus, regurgitates its effluvium, slavering at the gristle, which illuminates the moment with meaning. In searching for something specific I find I am drawn to the unexpected, the happenstance, a meeting with the outré and the horrible, by a wayward journey of chance. Whilst all around me the art world reeks and screeches of greed and onanism, I find myself trying to jump off an endless conveyor belt that brands mediocrity with uninspired masturbation trumped up as something thought provoking and unusual. It is plain to most reasonably intelligent people that much of today’s contemporary art is redundant, ridiculous and utterly useless to most people in society. It’s something to boast about for the bored rich plutocrats who run our societies and influence every aspect of our lives to their own political and financial gains. Ordinary people deserve something far better than this rubbish and the art world does little for the general public with its shallow contrivances and meaningless one hit wonders primed to make a fast buck or a ‘killing’. Most of western art it seems, is an insatiable re-working of art history, a ludicrous cross referencing process and emulation, an intellectual and aesthetically threadbare patchwork of pastiche manufactured by opportunists and laconic wannabees. Stepping outside of this arena, with a collector’s intuition and sensibility, I am absorbed by the study of fragments, tiny pockets of history, old photographs and images which have by virtue of their strangeness come to our gaze as vagabond souvenirs out of time. Here lies an undiscovered world of hidden gems that acts as an antidote to the fetid consumer crap which much of so-called contemporary art is. The arresting image on a c.1915-20 cigarette card captivated my attention when I first discovered it on eBay. ‘Buy it now’ the auction prompted me, so I did. What we see is a reproduction of a photograph taken somewhere in colonial Africa, delicately hand coloured (to give a nuance of reality in an age when colour printing was not taken for granted; a time when the world was mostly seen in monochrome). An elephant’s feet have been hacked off from its discarded dead body and the tusk inserted joining the feet by an ivory arc. Ivory: this highly valuable commodity was collected from countless millions of culled elephants with insane voracity during the 19th and 20th centuries. In this photograph it is being used to create an armature which connects two feet positioned on a dirt track outside a western style dwelling. The blue skies of Africa have been inked above to evoke an aura of naturalism. What are we to make of this monstrous spectacle, this brutal mockery of nature? In constructing such a horrific image did the sculptor of this atrocity mean to rebuild something of the metaphor of the elephant for us? Presumably, the feet could be moved from side to side to imitate a shuffling, shambling gait. During my adolescence I often accompanied my Mother to various regional antique auction houses and remember seeing similar fetishistic trophies: a hippopotamus’ foot hollowed out and lined with lead which stood in for an umbrella or walking stick stand, an elephant’s foot used as a spittoon, deer’s hooves transformed into ash trays. These large and rotund animal feet with their cracked and yellowish nails/hooves were perfect receptacles for 19th century rain water or saliva speckled with the bloodied phlegm of the industrial revolution. The trade in barbaric curiosities, disembodied from murdered creatures throughout time, and fabricated into macabre vessels for the Victorian necessity to kill and re-use persists, and I have seen other gruesome amputations in antiques arcades. 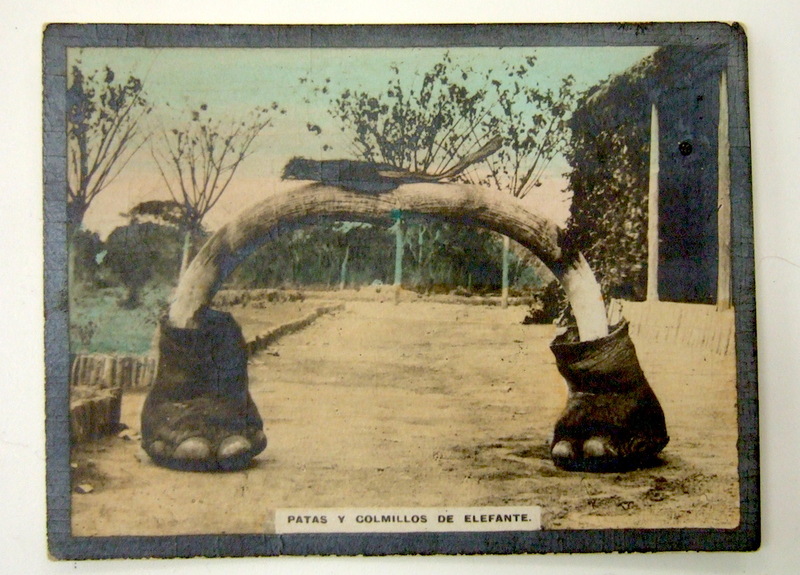 I bought the image because I had the idea that such a contrivance would need to be operated by someone (it would be heavy) and the cumbersome dead feet could be made to ‘walk’ – the ghost of the elephant might remain as a semblance in the imagination of the acquisitive collector, the colonial hunter, or in the collective dissemination of the mass produced cigarette card with its signature of hand painted reality. I have been collecting snapshots and real photograph post cards since the late 1970’s and use them as research. During my student years they were readily available at post card fairs and can now be found online in staggering abundance. In particular, I am looking for photos that describe and delineate ‘performance’ in its widest, most generalized form: actors, circus performers, dancers, acrobats, tableaux vivant and the more harder to define pictures, taken by amateurs of people masked or in costumes that indicate some sort of happening. Virtually all of these photos are anonymous and one can only guess the date (if it is not recorded) based upon the type of photograph, the fashion and content of the image. This snapshot of a child lying down on the grass in the garden outside a clapboard building dates from the 1920’s and may depict a little boy wearing a cat suit for Halloween. The photograph is almost certainly American by context and retains its original black paper triangles. When I first saw the image I was struck by the fact that the child is playing or acting out a personal fantasy – perhaps, being dead? I similarly have a photograph of myself as a child playing a similar type of ritual action in the garden of my family home. It is curious how these behaviours and actions cross time and repeat themselves in perpetuity from culture to culture. The photograph, which is a trace of a moment in time is transported by an exchange between successive ownership from the time of its origin (in this case c.1925) to the present day. We do not know where it will finally end up in 100 years time. This picture, with all its strangeness and uniqueness invites our speculation and probing imagination, which is essentially the benevolent gift of photography. Where was it taken? Are we looking at two barn buildings behind the child? What sort of plants are growing on the left hand side? We could all have been that child in the cat suit laying down in the vanished garden of 1925 acting out our imaginary world. Transport this concept into performance art and you have a fascinating scenario to play with. This is the key to my performance world. In another essay I briefly touched upon my use of photographs of people watching events such as parades, carnivals or occurrences that cannot be seen or understood. Often, we are just looking at a view of people’s backs (of heads, hair, caps, hats) and very few of them face the camera lens, except those that were conscious of being watched by a photographer. For me these pictures (which are all vintage photographs dating from c.1890-1950) are substitutes for a real audience and I display them during a real time performance in a quiet interval, perhaps when the live audience has left the space or dwindled down to just one or two trenchant stragglers. I call these photographs ‘absent presences’ and they are the static relics of an event I did not witness or experience in my own life, yet I am able to recycle the metaphor of their lived moment into my own time and space by imagination. In the quest to assemble a collection of vintage photographs of watchers I am not looking for masterpieces of photography that will cost thousands of pounds. Instead, the pictures can be viewed as candid snapshots and often bear the hallmarks of an amateur hand: loss of focus, poor compositional framing, unclear perspective and over/under exposed. I am searching for images that portray some significant event that’s being observed by people but we cannot possibly know what was happening. Such images are enigmas and tantalise us with their scant detail. By looking into the picture we crave more information. 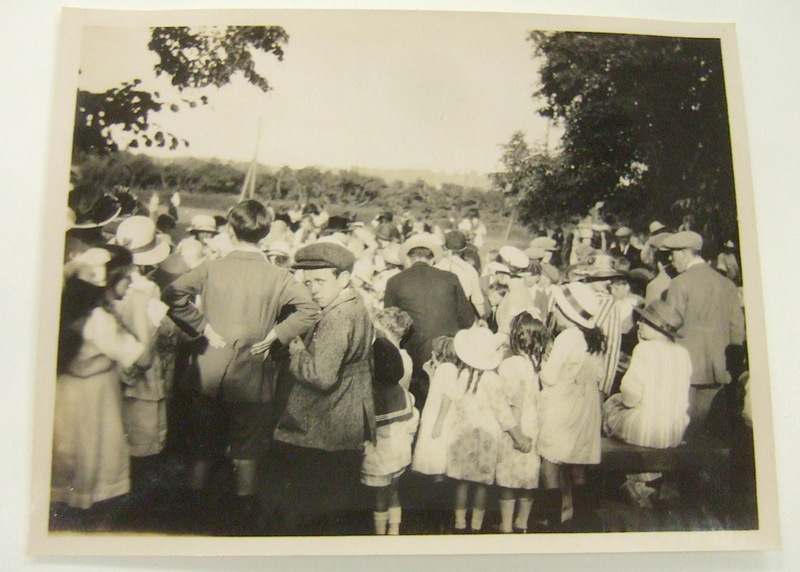 Two vintage silver prints seen reproduced here show us a crowd of over 20 visible people in an English context. The pictures were made in c.1915-18 judging by the fashions and the type of photographs. We know the event being watched happened during the summer because the foliage in the frame is abundant and shows none of the transformation of leaves in Autumn. 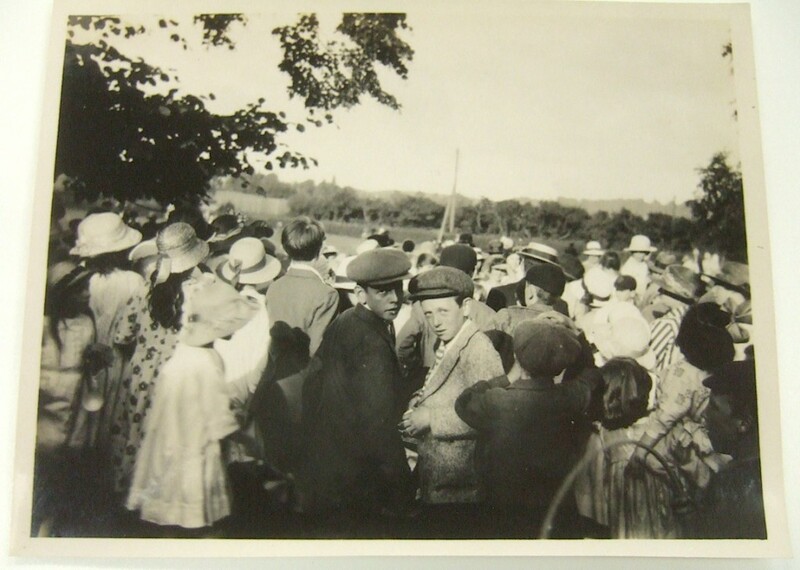 In the first photo a boy is half turned and semi-aware that he and the greater crowd are being photographed. He sports a large flat cloth cap. One is entranced by the fact that the audience is mostly comprised of children in their Sunday best. In the second image the same boy is turned round with his friend to directly confront the cameraman. They are both conscious of being photographed and are the only people in this sea of heads who knew they were being watched as they watched something else. The curiosity value of studying the fashions of 100 years ago is a tremendous reward for scrutinizing this image. Despite the complete lack of colour, the photographs have beautifully rich tones and shadows which give the watchers a completely real sense of vitality. Could this be taken in May? In the distance there is some sort of a pole and my inclination is to surmise that they were observing a May Pole Dance. I cannot prove this but I feel an empathy towards this notion. The photos were taken in a rural setting (there is no town or village visible) and one can almost feel the sunshine on the backs of these children and see the shadows of bodies fall across the white starched linen and cotton garments. A toy hoop is coming into frame in the second image. The sad existential realization that all these people are dead now is the trauma of the photographic trace. There can be no possibility that anyone captured watching this unknown even in 1915-18 is alive now. All these people are ghosts in our imagination, they are all bones, skulls and rags in coffins. It is because of this that I feel a twinge of sadness when studying the phenomenon of disappearance. In another snapshot a group of 4 unidentified adults are gathered together in a forest or woodland setting, in apparent darkness. It is hard to discern if it is day or night. I date this image to 1925-30. Two men are partially aware of being observed by the photographer and half turn towards the camera but do not look at it. Two people are seated on a wooden plank bench and seem preoccupied with their own world which is completely alien to our knowledge. What lies beyond our view, in front of the group? Is there something on the ground that we cannot see? Is it another person? We will never know the answers.